Riccardo Morandi (1902-1989) is best known as being the engineer that conceived Morandi Bridge in Genoa. 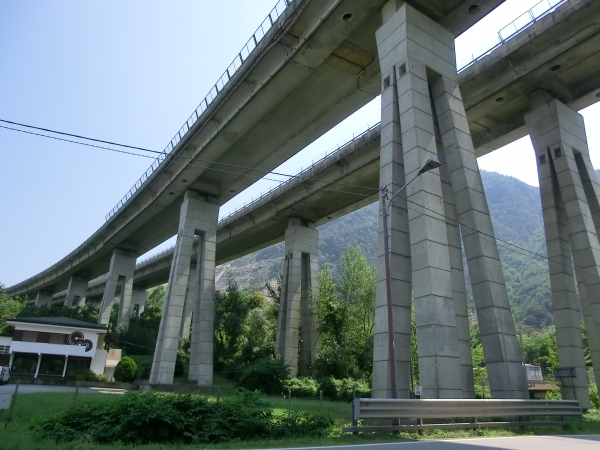 This bridge was part of the Polcevera viaduct on the A10 Autostrada dei Fiori motorway. The bridge, was a major link from Italy to France. 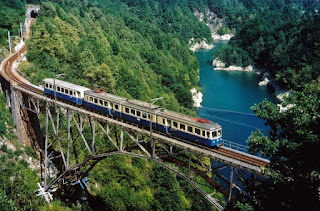 The viaduct was built between 1963 and 1967, costing €2 million at that time, and was inaugurated on 4 September 1967. On 14 August 2018 at around lunch time, during a torrential rainstorm, a 210-metre section of this bridge collapsed. Apparently the bridge was hit by lightning before it collapsed. Between 30 and 35 cars and three trucks were reported to have fallen from the bridge. 43 people were confirmed dead and 16 injured. 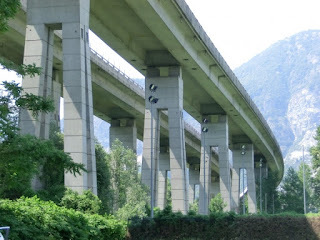 The same engineer Morandi, at the end of his career designed also the viaduct Stronetta. This work is the last section of the A26 Voltri-Sempione motorway. 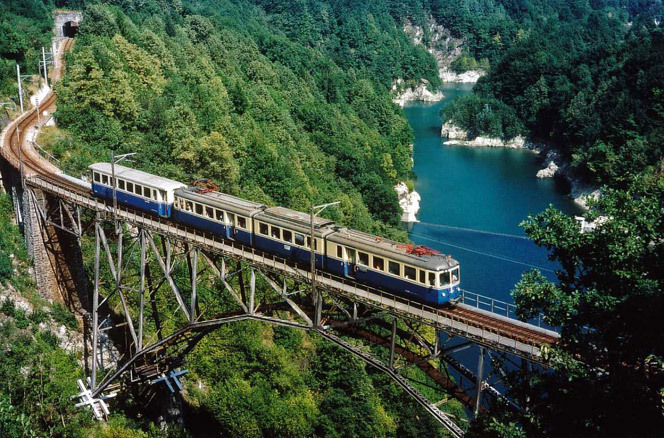 It's a sort of long ramp that, after the tunnel of Feriolo, descends, making a sharp curve to the left, to the Piano Grande and Gravellona Toce, the terminus of the highway inaugurated in 1995. Morandi's original design was prepared in 1984, five years before his death. The works were completed in 1990 and resulted in the construction of a bridge 1,117 meters long, supported by pairs of pylons, placed at regular intervals each of which supports two lanes, which have a particular shape: a stand with four legs. Morandi is remembered as a pioneer and innovator in the use of prestressed concrete, a technique for which he registered a patent after the Second World War. In his long career, which has also seen him as a university lecturer, he has designed and taught around the world, designing viaducts in Africa, Venezuela, Sweden, Libya, Ecuador, Colombia and Canada. On 4 August 2018 at 16:10 Junkers JU-52 HB-HOT took off from Locarno Airport, with a crew of 3 and 17 passengers. The final destination was Dübendorf airfield, located next to Zürich. About 40 minutes later the airplane flew up a north-northeast course into the basin southwest of Piz Segna (Canton of Grisons). At the northern end of the valley it began a left turn, which turned into a spiral-shaped trajectory down. A few seconds later the aircraft crashed approximately perpendicular to the terrain. movie "Where the Eagles Dare". The crash of the Ju-52 remains a mystery even three and a half months after the fatal vertical crash above Flims Grisons. "...As of the date of publication of this interim report, there were no indications for pre-existing technical defects that would have caused the accident..."
Photos and film footage of the Junkers Ju 52/3m HB-HOT airplane which were taken on 4 August 2018 ideally after 16:00. GPS tracks taken in the years 2016 to 2018 during a flight with any Ju 52/3m of Ju-Air. the submission of information should be made with the location, date and time of the recordings. Our prayers and heartfelt condolences go out to the families of this tragic loss. 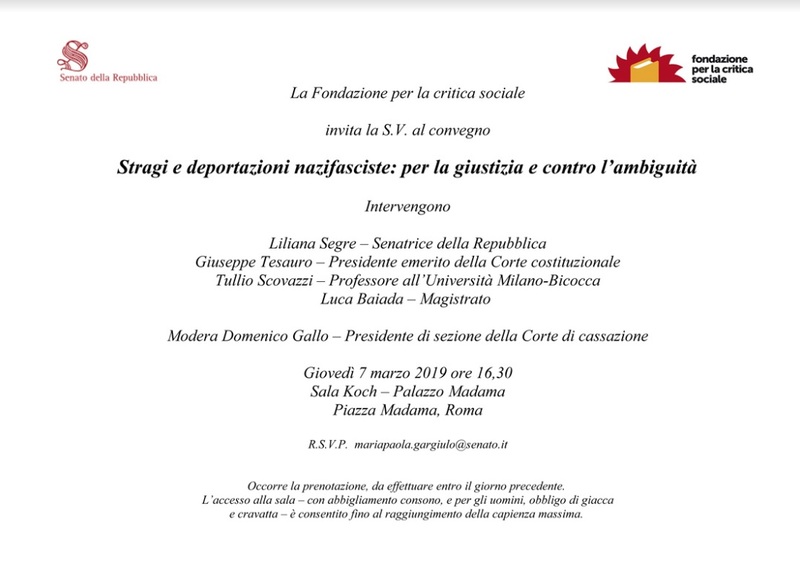 There is still a less researched chapter in the history of the German and Italian fascists occupation of the Lago Maggiore region, that is the quantification of the war crimes committed during the period 1943-1945. Then and Now of the SS-Pol.Rgt.15 in Rome. 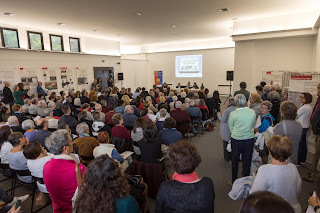 Fondazione Museo della Shoah, Rome. Main picture by Google Street View August 2017. A recent article of Insubrica Historica on the First Battalion of the Panzer-Grenadier Regiment 2 of the Waffen-SS Leibstandarte Division, has brought some light in the activities around Meina and Verbania, during September 1943. In less than 10 days about 50 Jews were brutally killed by members of the Leibstandarte. 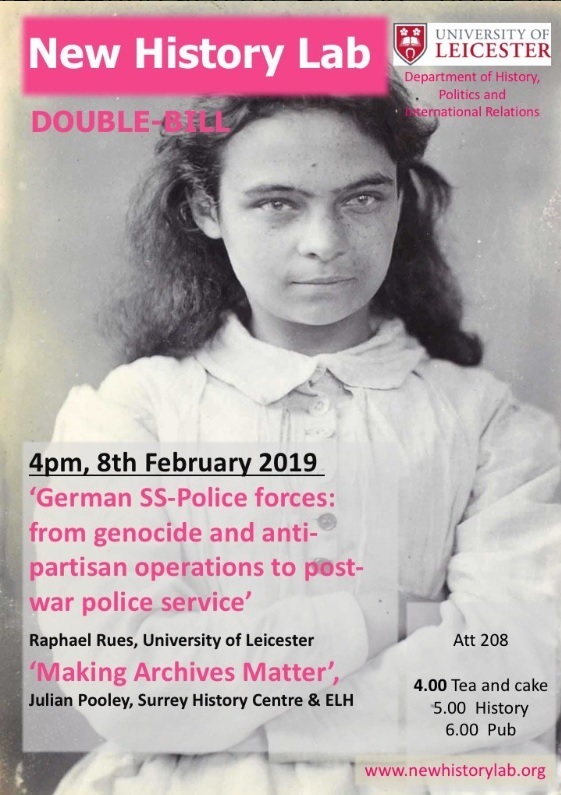 Even less researched are other war crimes that happened in the same region, mainly committed 12 months later by members of the SS-Polizei Rgt. 15. 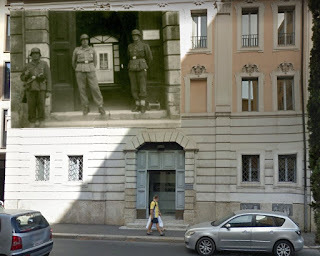 The Italians operations of the SS-Polizei first started in Milan and Rome. 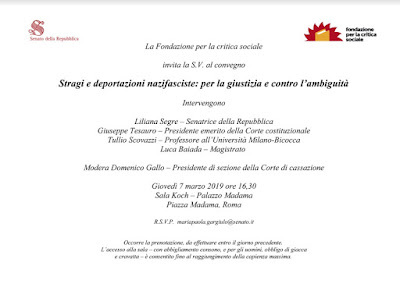 Insubrica Historica has planned to spend a weekend in Rome. In order to best prepare for this historical trip, we have created a Google Mashup map that portrays the main sites where the Germans where active in Rome (see below). Just few sites have a direct link with our Insubrica region. Notably the sites of the SS-Polizei - eg. Via Salaria 227 - as well as the Fosse Ardeatine. The massacre of the Fosse Ardeatine is particularly important for Cannobio. The SS Captain that directed the retaliation of August 1944, Hans Clemens, was one of the major protagonists and killers at Fosse Ardeatine. An historical evening planned for 20.3.2019 in Cannobio will bring more light to Clemens and its activities before, during and after the war. 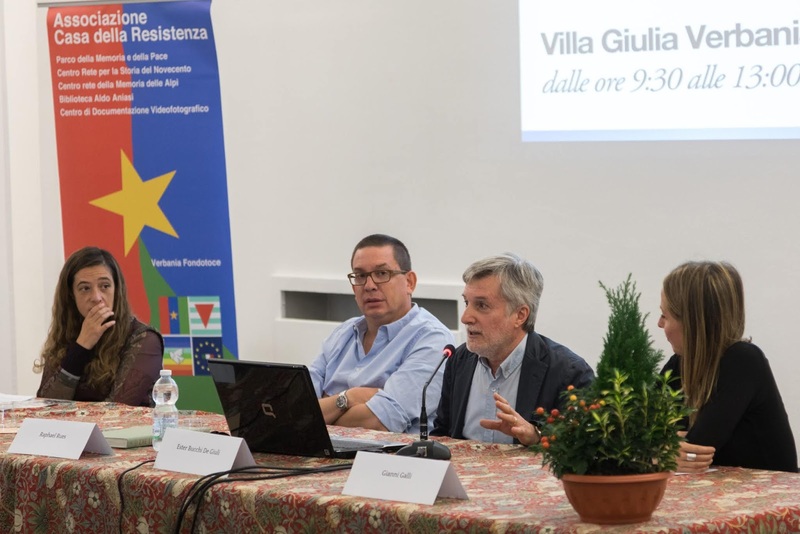 Insubrica Historica is about to visit Rome this November. It seemed to us obvious that a visit in the Italian capital should have paid also a tribute to Insubrica artists and architects. We have realized a map that attempts to list all the major works by Francesco Borromini (25.9.1599 – 2.8.1667), Carlo Maderno (1556 – 30.1.1629) and Domenico Fontana (1543 – 28.1.1607). These are three personalities that technically could be considered today as being Ticinesi, even if the Canton was created only in 1803. We will update Insubrica Historica of what we managed to visit during our stay. We are very much thrilled by the vestiges left by these Insubrica personalities.